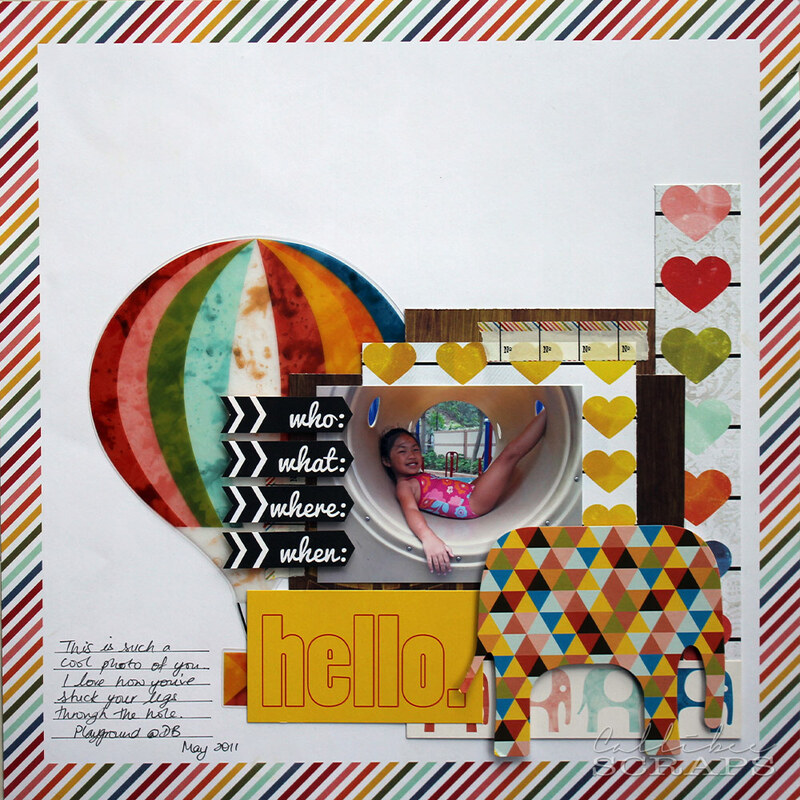 If you've looked at my layouts, you will see that I prefer layering, fussy cutting, inking, some stamping and distressing. Most of my pages take three to four hours or more to do. It's not always easy to find such a stretch of time in one go, so, once in while, I have to do quick layouts. Ones that take half an hour to an hour, from start to finish. It's so satisfying to get several pages done in a day or two, especially on the weekends when I have to fit it between spending time with the hubby, child and two cat babies. For these pages, I've kept embellishments to a minimum, mostly just using my trimmer to cut out the paper and sticking it down. 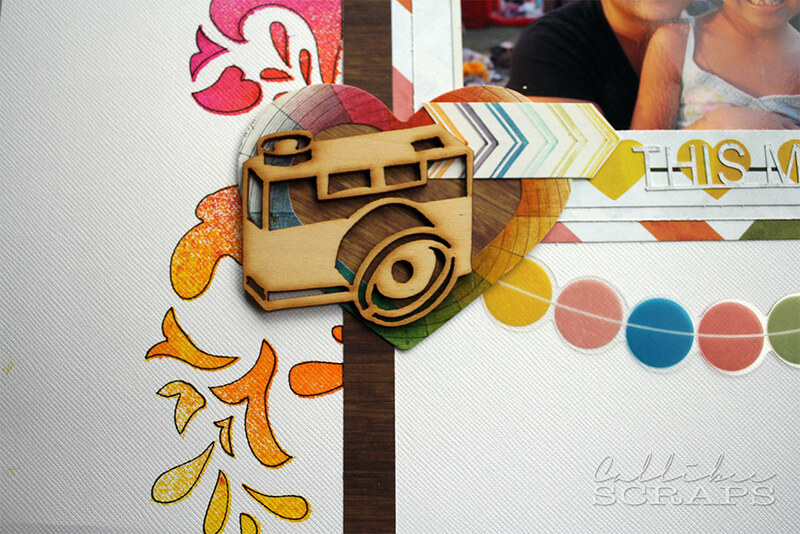 There is minimal layering, using the contrast of colours and patterns to build the layouts instead. The first two layouts feature new winter CHA release, Glitz Design Color Me Happy, which are in the HKMC shop right now. I had four pieces of paper and just a handful of embellishments (semi transparent overlays and die cuts, a roll of washi tape and a roller stamp) to work with, but they were so colourful and a little goes a long way. 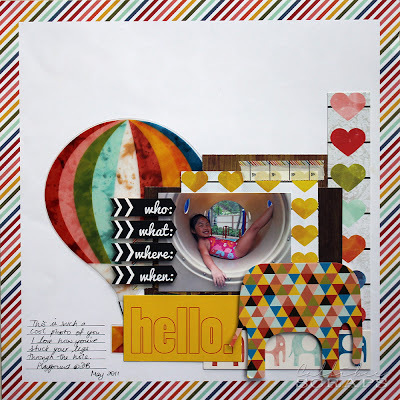 The paper comes with the rainbow stripe frame, which already takes out half the work. 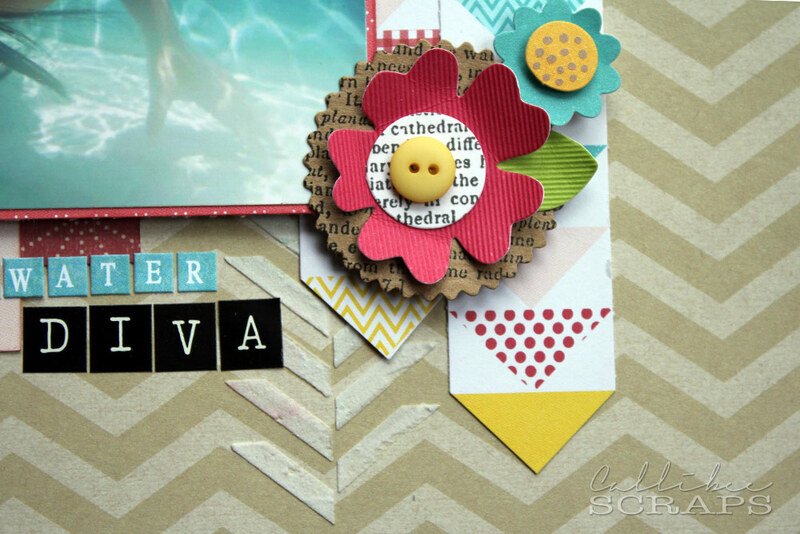 I love all the colours of this paper line. I jumped for joy when I saw the air balloon. I just love them. The black arrow tags were cut from another of the Glitz papers. 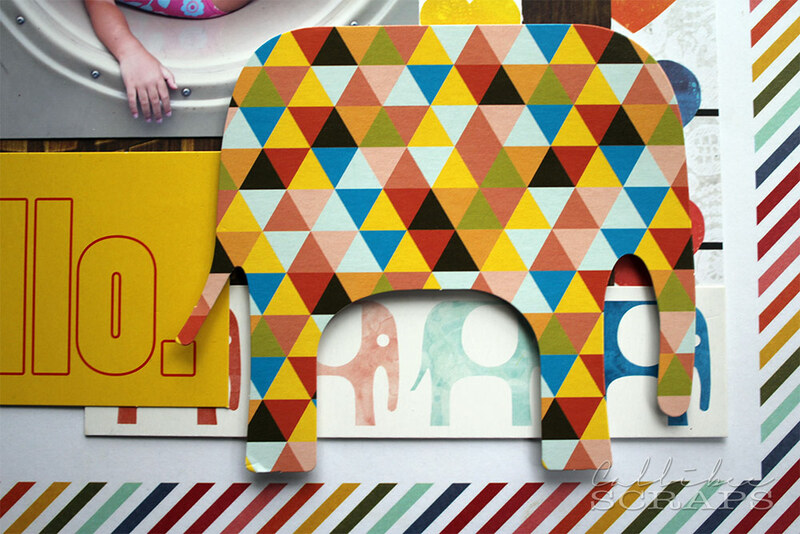 How whimsical are all the elephants - this big one reminds me so much of Elmer the Elephant, with its patchwork pattern. 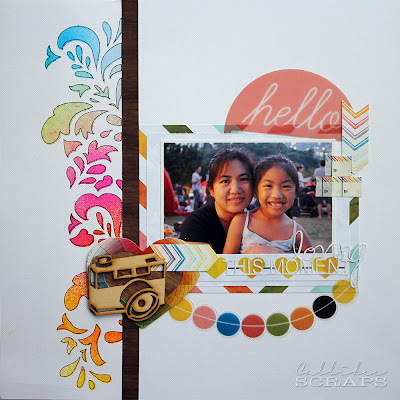 I love the contrast of the rainbow colours with stark white cardstock. It just makes everything pop. For the masked area, I taped off a section of a 12"x12" stencil before misting with several colours. Let it dry and then use the stencil to outline the pattern in black pen. Easy as that. For the multi-coloured arrow tag, I coloured each raised section on the roller stamp with distress markers, and rolled out onto a spare piece of card before cutting it out. The title was cut using my eClips. I wanted a subtle title, hence the light grey. 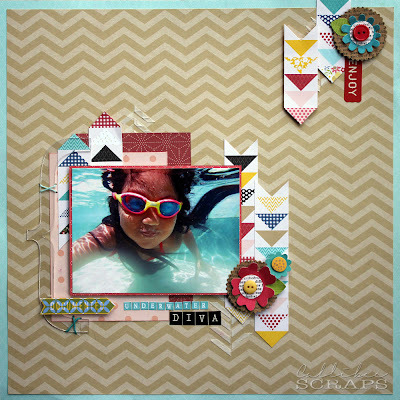 For the last layout, I love this photo so much and wanted it to be the main focus, so all other elements were kept to a minimum. I also like the kraft colour chevron that contrasts nicely with the blue backing. 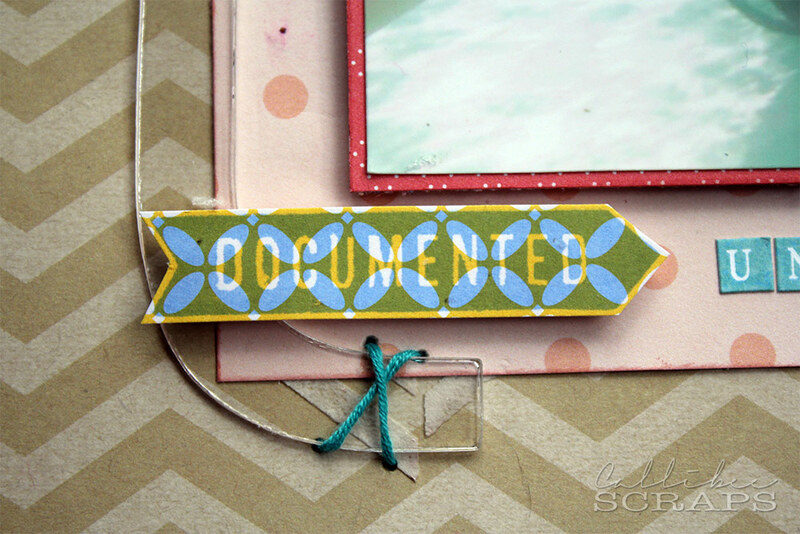 I stamped the "documented" on one of the patterned papers and cut it out. The acrylic bracket is anchored in place by some stitching. I used a 6"x6" chevon mask to add some light molding paste for a little more dimension. This was also very quick. 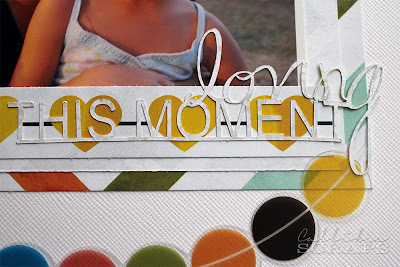 Once you've figured out how you are going to lay out your page, take everything off and just add the molding paste in small areas, where you know they will still be seen. A quick blast with a heat gun will set it and then place everything else back on. There we are. Three layouts in two days. So, challenge yourself to try and get a few more pages done, quickly and simply. Minimum cutting, minimum fuss. I'd love to see what you come up with.